Which is better? The bike-ride? Or the post bike-ride beer? Two epic rides are well-rooted in my memory of last summer – same collaborators, same formula – a grinding hike-a-bike up sandy, rarely-used trails that disintegrated beneath each foot-fall and sloughed into socks and shoes. Bike-frame pressing against knobby little verterbrae… Skittery thoughts, (what the…? ), never quite allowed to gain purchase. Treats and snacks passed around at the highest point, 360 degree views and the last slugs of water so much sweeter for having sweated out a month’s worth of toxins and sediment. As for the beers that we cracked open over chips and cookies and chocolate around the tailgate, at the end of that 7 hour day and a whooping, leg-shattering descent… they packed a mighty punch. 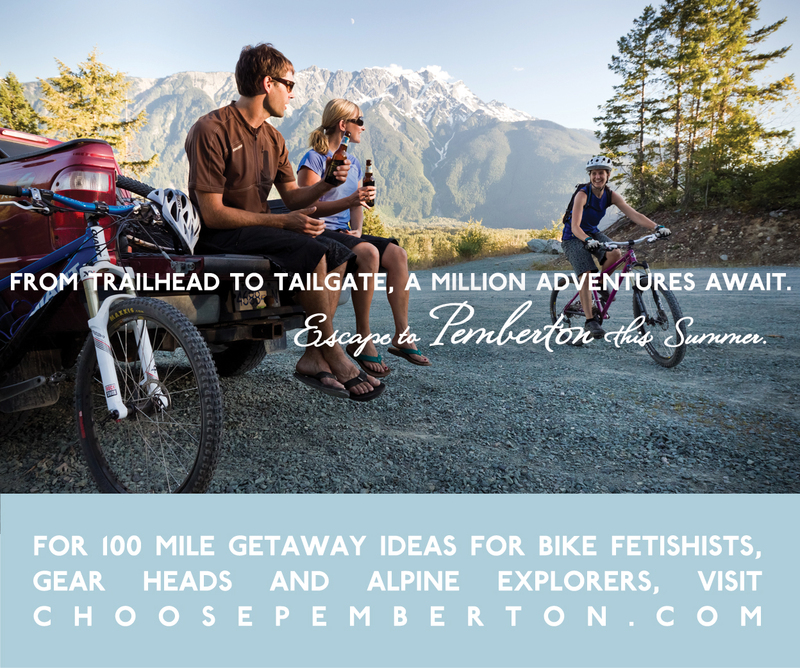 What says “Pemberton” to me? Trailhead to tailgate adventures. That’s the story I wanted to tell with the second ad for our campaign for Pemberton’s Economic Development Commission, to let people in on just one of a handful of reasons they should Choose Pemberton.